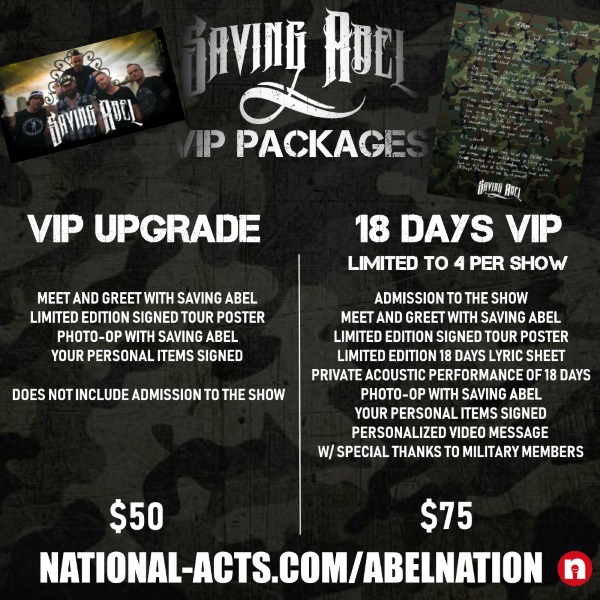 Tickets for Saving Abel VIP - Clifton, NJ in Clifton from National Acts Inc.
*Check-in for the meet and greet is usually after doors open at Saving Abel's merch table, but can be subject to change. *YOU WILL RECEIVE AN EMAIL WITHIN 24 HOURS OF THE SHOW WITH SPECIFIC INSTRUCTIONS. ***The 18 Days Package includes admission to the show as a member of the band's personal guest list. When you arrive at the venue, let the door person know that you are on Saving Abel's guest list, show them your photo ID and you should get right in. You will not receive an actual concert ticket as part of the 18 Days package. However, the guest list spot is the equivelant of a standing room only general admission ticket. No special seating is offered with this package since we are not affiliated with the venue in any way. These packages are limited to 4 per show. © 2019 National Acts Inc. on behalf of Saving Abel. All sales are final. Tickets are non-refundable.